Recently i was reading the book, "On the shoulder of giants" by Stephen Hawking. The basic idea what the title implies is that the newer discoveries are based on something phenomenal in past. So, i recollected, it has been a long time since i have last written a topic of basic interest. Something at the grass root level. And when i was just thinking about this, i was reminded about Robert Koch. Am not going to spend time here talking about his achievements or his life history. 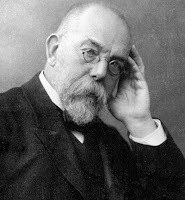 If you are interested in his biography please go here Rather, i want to discuss a few aspects on the most famous concept in history of microbiology referred as "Koch postulates". The basic ideology of the postulates is in context to identify the causative organism in an infectious disease. Based on personal experience and a really good scientific evidence R Koch defined 4 steps in this basic principle. The 4 steps were association, isolation, inoculation and re-isolation. Thats all!!! Am reminded of a phenomenal law that holds true to date- "Occam's razor". The principle holds that when there are several competing theories, each equally competent of explaining a well documented phenomenon (Or i should rather say observed phenomenon), the simplest of the explanation is more likely to be the correct explanation. If u can see the meaning of what i mean to say here, you well see why am i saying this. The simplicity of the postulates, hence provide the likeliest explanation of pathogen. 1. Similar (Here referring to a species) pathogen must be consistently associated with the disease. 2. The pathogen should be grown as a pure culture in a way that its character be described. This was a fantastic explanation in the early days of microbiology and a terrific lot of organisms were indeed proved to be the causative agent. But, as always biology meets an exception. The 1st step is violated by many viruses, such as pox virus in which less than 1% of the infection is actually clinically apparent. The postulate failed to support discovery of those pathogens which cannot be grown in pure form in laboratory, a blow to the 2nd step. 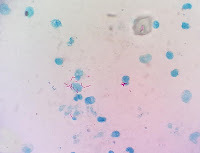 Coxiella burnetii, is the causative agent of human Q (Query) fever for long period of time without ever having attested to the principle of Koch. Of course now we know how to cultivate them (Link) in pure. Certain pathogens maybe grown in pure culture but the 3rd step is not possible when humans are the only host. (Ethical considerations). Koch himself was well aware of these limitations. You see we play around a bit. In a classic paper by D N Fredericks and D A Relman (Link), a thorough discussion was presented on why we need to reconsider Koch postulates and come up with a few modifications. With more and more molecular biology techniques, the traditional pure culture and identification seems to fail in upholding the original postulates. This probably led to more sophisticated to what we know as "Molecular Koch postulates". 1. The virulence trait under study should be associated much more with pathogenic strains of the species than with nonpathogenic strains. 2. Inactivation of the gene or genes associated with the suspected virulence trait should substantially decrease pathogenicity. 3. Replacement of the mutated gene with the normal wild-type gene should fully restore pathogenicity. 4. The gene should be expressed at some point during the infection and disease process. 5. Antibodies or immune system cells directed against the gene products should protect the host. But then people argue, are we deviating from the classic microbiology. What i would like to say is "No". Just take a look. The molecular postulates are just a derivation of original condensed and redesigned to molecular level. And thats why i say, "We still stand on the shoulder of giants." Dengue vaccine- "Hit or miss"
Before i begin this blog session (Not exactly), i have a small statement of thanks giving to make. The blog started at the beginning of this year with as few as 5-7 page hits a week. That was pretty impressive for a beginner in a sub-domain blog. From then i have been writing, and evolved writing about things that i wanted to express about or what i thought was worth a share. And now i have nearly 700 page hits a week after 9 month of inception. Needless to say, I'm very impressed and happy about it, there is one thing that i haven't still achieved. Am referring to the discussion here. The main purpose of the internet share was to evoke thoughts from various people, which hasn't come true yet. But then i have positives to take from this blog. The 2nd thing that i have to say is that i have decided to move my blogging to my new webpage soon. I don't wish to have an hibernating domain name. And i will see you people soon there. As always first a small news on science as a whole. Unlike always where a top science news was something from physics and space, this time i have something special on nanotechnology. 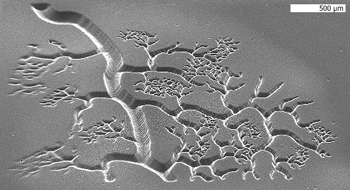 The researchers from University of California have been able to create nano-models from hydrogels. Ooh, what is the big deal in that. The creation is not a big deal. But the time they take to create this is. Shaochen Chen labels the biofabrication technology, called dynamic optical projection stereolithography (DOPsL). For more information and source go here and here. For a long time now, the biology science has been studying molecules by the process of tagging. The problem is however, the tags are usually irreversible (Not in the strictest sense) and removal may cause damage to the protein which excludes it from recycling. A new innovative method from Michael Burkart's laboratory, gets around this problem. They find a method to attach chemical labels into proteins and can subsequently remove them at will. An incredible leap is flexibility of what can be attached. This can be dyes, purification agents or metabolic products. The study can be found here. Burkart said "We've shown that we can do this, at least four or five times, without any degradation of the protein" (Source). You all should be aware of the great scientific debate on the link between XMRV and Chronic fatigue syndrome. The whole world of science was split into debate (Read more here). With every new study the strength of association seemed to have weakened and the weight of evidence was in favor of "No". The final blow to this has come from the NIH project costing nearly US$2.3-million. This study by W. Ian Lipkin is the feature of week in the world of science (The story is well covered in nature). I have two equally interesting stories in microbiology that i want to blog about here in a bit of detail. I don't know which paper need to be summarized and what need to be elaborated. The first paper of interest to me is about the recent findings on "CYD tetravalent dengue vaccine" and the 2nd is on "pyridomycin" as potential anti-TB agent. Finally i decide that the vaccine story will go on a bit detail and i just tell you about the new drug. Tuberculosis is a global health problem and more common in the developing and under developed nations. Mycobacterium tuberculosis, accounting for almost 2 million deaths annually. The problem? Its diagnosis and treatment equally. Most of the bacteria are well identifiable in the laboratory by culture methods which takes less than 3-4 days. That means the pathogen is recovered, tested and appropriate treatment is initiated. But the stealth nature of TB, which replicates something like once in 20 Hrs is a slow grower. Even with the best culture medium support, the bacteria takes about 3-4 weeks to make a colony appearance. Ooh, that's nasty and to wait for such a long time is not on the good side of patient. One of the gold standards is still Acid fast staining method. However, the smears are positive only if the bacterial load is more than 10,000 bacilli/ml. Needless to say we are coming up with new technologies but its far from reach in routine resource poor laboratories. The POCT (point of care testing) is still AFB. The second problem that the pathogen presents is treatment. The covertness of bacilli is the problem again. The very long replicative cycle which is difficult to attack is the main problem. And we have the special problem of dealing with a special C50 based mycolic acid based cell wall to deal with. The number of drugs, hence in the clinician's armor is far too less. Natural products such as the rifamycin group (For mechanism of action, here). The paper in EMBO molecular medicine by Ruben CH etal, has discussed the importance of Pyridomycin, as a potential anti-TB agent. The compound is naturally produced by Dactylosporangium fulvum. The study concluded that the compound is a competitive inhibitor of the NADH-binding site of InhA, NADH-dependent enoyl-[Acyl-Carrier-Protein] reductase, the target of the two anti-tuberculosis pro-drugs isoniazid and ethionamide. The MIC was studied using resazurin reduction microtitre assay. And what impressed me is the MIC was just 0.39 for TB. I strongly recommend you read the paper (Its open access). A vaccine is highly desirable against a pathogen that affects almost 3/4th of the world especially the tropics. But there seems to be a problem. On primary infection the virus causes production of antibodies. Nothing new in that. A second infection subsequently by any serotype usually tricks the immune system and causes an improved response. Remember the similarity quotient is high and so cross reacting antibody is present. The antibodies bind to the surface proteins of virus, but doesn't inactivate the virus. The immune system responds with macrophages in massive concentration leading to "Antibody-Dependent Enhancement" (ADE) of a viral infection. A cytokine response is initated and endothelial tissue become permeable which results in Dengue Haemorrhagic Fever (DHF) and fluid loss from the blood vessels. So the catch of the problem is that when immune system is sensitized to the dengue surface antigens, the body responds inappropriately causing more grave condition. In this case the well known fact is that NS1 cross-reacts with human platelets and endothelial cells and cause their damage and dysfunction. Thats is why, the platelets are effected when there is a dengue inection. The Fig 2 below explains the auto-immune action. Several attempts were made in making a vaccine. However the trick was to induce an antibody independent immunity, in other words cellular immunity. CYD TDV is composed of four recombinant, live, attenuated vaccines (CYD-1-4) based on a yellow fever vaccine 17D (YFV 17D) backbone, each expressing the pre-membrane and envelope genes of one of the four dengue virus serotypes. The vaccine is produced using vero cell lines. The phase 2b study was conducted on 4002 enrolled Thai children from Feb 5, 2009, and Feb 5, 2010. The vaccine proved to have a efficacy o more than 70% in case of DENV-1, 3 and 4. But, the mark was not hit with DENV-2 for unknown reasons. Now before i get to dealing with type 2 let me try to ask "Is 70% efficacy enough". Many scientists over the world opinion it as not good enough response. "The question is, is the glass half-empty or half-full? True the vaccine shows protection against three of the strains, but unfortunately and this is very disappointing, overall it was not effective, showing no protection for the most common dengue strains circulating in Thailand. This is a very disappointing result for people interested in dengue that have been following this research -- we were all hoping for a much stronger result. The current data suggest that there is still more work needed on dengue vaccine development." My point is there is no doubt that there is scope for improvement. But i have doubt if it is disappointing. I would be more optimistic that this is encouraging. Everyone remembers the malaria RTS,S/AS01 vaccine. It had less than 50% efficiency, but yet considered to be a achievement. The argument comes from a mathematical reasoning that the protected 50% will reduce the transmission to a high degree. Let me explain. The mosquito transmission from one human to another is quite low, and some sources claiming it to be less than 10%. So once you reduce the number of source patients to less than 50% by vaccination, theoretically the transmission in the community as a whole is less than 10%. After all our goal is to achieve herd immunity. The 2nd part of the question mark is on DENV-2. Am sure the team is working on that. This is a multi national study and many of the data is expected to reach completion on 2014. So maybe the genetics of the study population doesn't respond well to DENV-2. My remark is that the conclusions disappointing and Not effective is inappropriate. Moreover this study shows that dengue vaccine is indeed a possibility by getting around an antibody independent mechanism. As the authors remark in their conclusion in Lancet, "In the context of WHO goals to reduce dengue mortality by at least 50% and the morbidity rate by at least 25% by 2020, this study represents a major milestone." Just a point of note to people who think dengue is unbeatable right now, we have the Wolbachia as a tool under study . I haven't blogged for last 2 weeks for personal reasons. I have been thinking on what should i write on. For a moment i was thinking of how microbiology has come up in past decade. We no more speak about microbiology as a subject. It has specialized and super specialized. And these new branches are evolving into science in itself. We are talking about new emerging frontiers such as Microbial forensics, Microbial endocrinology, Microbial metabolomics and blah blah. Probably we this age of recombination. Take every field known to science and combine with microbiology. And that is seriously expected to work. Reason, everything has a connection with Microbes. Nature Journal is a pay wall journal. But then they occasionally come up with a paper that is open access. When they do, it means they have something that is too important and must be shared to the world. But what if i tell you that they have made available a huge list of knowledge on ENCODE (Encyclopedia of DNA Elements) project totally free of charge. You must check it out here. I have 2 questions for you. 1st what if you cannot smell? 2nd, Is gene therapy feasible or practical (What an unrelated question!!!). Well, then let me combine the 2. Can gene therapy correct genetic olfactory disability (The combining of questions isn't looking right, but will do for know). As a proof of concept, it is possible. Jeffrey Martens team has did it. 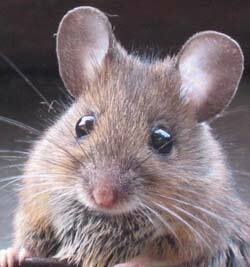 They have been able to correct a mice with olfactory defects and restored their sense. “I would like to see this move towards correcting blindness or kidney dysfunction,” Martens says. The story is here. This leads me to an idea. Next time someone you see someone who has lost his sense send him to this lab for a correction.....!!!! And by the way if you want to know how the mouse smells check the source link in photo to right. When we study virology, the first thing that we learn is about the cellular defenses to these intracellular pathogens. Interferon-γ is probably a important player. And there exists a rare condition where people evolve autoimmunity to the Interferon-γ (I can call it immunity against immunity). And what does the disease look like? If immunity is attacked it causes immune suppression. Thats the theme of the story published in NEJM (Link). The researchers found that nearly 88% of the people who had opportunistic infection resembling as that of in AIDS, had an auto antibody. The study was done in Thailand and Taiwan. So now that means to me that all those people who have opportunistic infections which otherwise is considered as hallmark of HIV is not actually so. And when the authors say 88% (of 203 subjects), i guess its not so rare after all. "These findings provide new opportunities to understand the relationship between immunodeficiency and autoimmune diseases, the topic of a recent AARDA-sponsored international symposium," says Dr. Noel Rose (Source). As i say this, I remember a compound Fontolizumab that has anti-interferon-γ antibody property. Just saying!! Ah so what was i talking about? Oh yes, Immunosuppression. And thats exactly the topic for short discussion today. The paper that am focussing here is titled "Single mutations in the transmembrane envelope protein abrogate the immunosuppressive property of HIV-1" by Morozov etal. I have written previously quite a few blogs about HIV previously. In case you haven't read them yet just check them out. And i also recommend you have a look at my presentation on HIV life cycle. There has been multiple theories on how HIV actually achieves immunosuppression. 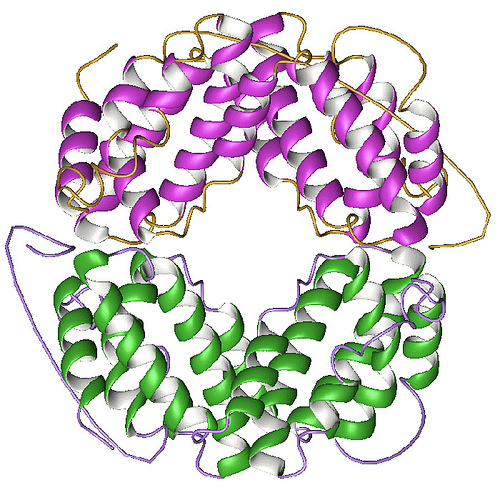 The first well known version is that IL-4 can be up-regulated by the HIV tat protein. IL-4 has known immunosuppressive activity (Source). 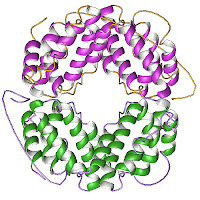 Another famous theory is the play by Nef protein and IL-10 which can modulate the CD14 expression (Source). A more known theory is that HIV binds to CD4+ CD25+ regulatory T cells that can control the immunity. And of course there are many more theories such as this, where different proteins of HIV are implicated in various situation. Previously a work done by Tomer Cohen etal (Link) showed that there is a striking similarity between HIV gp41 transmembrane domain and transmembrane domain of the α-subunit of the T-cell receptor. The similarity was nailed down to 9 amino acids. It was then realized that all the retroviral transmembrane region had a special sequence referred as isu (immunosuppressive) domain. They inhibit mitogen-triggered proliferation of peripheral blood mononuclear cells and hence cause immunosuppression. So there is something in the gp41 that really has a isu effect. So an elaborate study on this protein was done. The finding was that gp41 was a very good modulator of cytokine expression. Altering the isu domain at 6 critical sites had serious impact on the viral capacity to modulate immune response. But the authors clearly mention that the this is not the sole reason. They postulate that the interaction of gp120, Tat and Nef along with the isu could explain immunosuppression. Vladimir A. Morozov, Alexey V. Morozov, Marwan Semaan and Joachim Denner (2012). 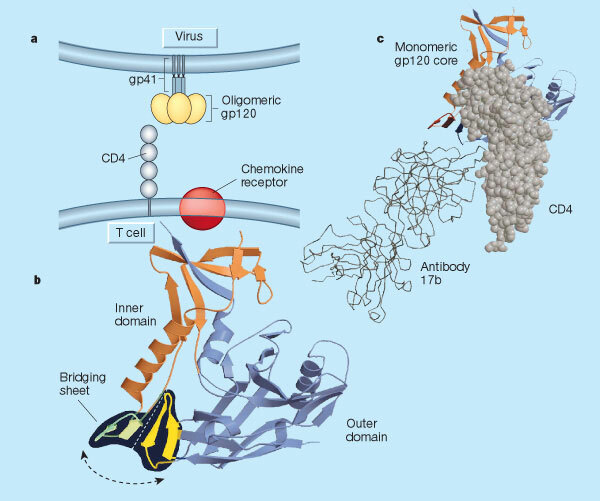 Single mutations in the transmembrane envelope protein abrogate the immunosuppressive property of HIV-1 Retrovirology, 9:67 DOI: 10.1186/1742-4690-9-67.